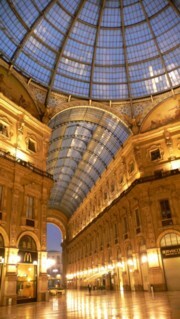 Milano is the richest and second largest city of Italy and the capital of Lombardy. Even if the city is known as the city of youth and modernity, the Milanese have never forgotten about their traditions. Their respect for their religion is so special that they even pay a special tax to maintain the Cathedral. 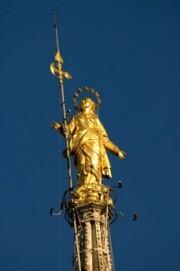 Therefore, it does not surprise that the symbol of the City is the gilded statue of the Virgin Mary at the top of the Duomo. The city consists of a historic core, which extends around the Cathedral. Milano is the capital of the automotive industry and the financial markets of Italy since the seventies, but the highlight of the city are the locally-based fashion houses, which have triggered the influx of many media and advertising agencies to Milano. It is still the market place for Lovers of Italian fashion. Supermodels and paparazzi from all over the world come to the city twice a year because of the spring and autumn fashion shows and the world looks to. Valentino, Versace and Armani might design and produce their clothes elsewhere, but Milano retains its reputation for flair, drama and creativity and is Italy's stage and catwalk. 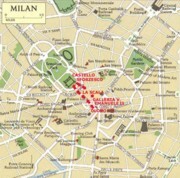 The tour will start with visiting Milano’s famous Cathedral, the Duomo Santa Maria Nascente (external visit). It is one of the most famous buildings of Italy and Europe and the fourth largest church in the world. The 157 meters long and 109 meters wide Cathedral can accommodate up to 40,000 people. The big, colourful glass windows of the choir are among the largest in the world. At this place previously there were the early Christian Cathedral of Santa Maria Maggiore and the slightly larger Roman basilica, which was doomed later in the name of Holy Tecla. Both go back to the fourth century and have been repeatedly destroyed and rebuilt changed. The construction of the Cathedral was started at the end of the 14th century by the Duke Gian Galeazzo and completely finished only in 1856. 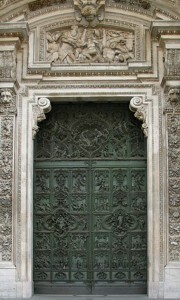 The building, which is unique thanks to the bright marble and the almost 4000 Statues, was doomed in 1572 by Charles Borromeo in the name of Santa Maria Nascente. The style of church architecture is Gothic what represents an exception within the Italian architecture. Next stop is the huge Sforzesco Castle with its central tower Torre del Filaret and the 4 page towers. The Castle was built as a defense fortress in the 14th Century under the reign of Gian Galeazzo Visconti. At the Ground floor of Palazzo Ducale: Museum of Ancient Art, for example with the recent works of Michelangelo, the unfinished marble statue Pieta Rondanini by Michelangelo Buonarroti (1564). At the First floor of Palazzo Ducale: Museum of antique furniture and art gallery, for example, with a portrait of Ludovico Maria Sforza, known as Il Moro. In the halls of Rocchetta are collections of applied art and a collection of valuable historical musical instruments. The Torre Castellana on the ground floor accommodates the treasury Sala del Tesoro with frescoes by Bramantino. In the basement of the Rocchetta and the Sala Viscontea are the Prehistoric and the Egyptian Museum. On the way back to the Cathedral Square you’ll have the possibility to admire the famous opera house La Scala and finally the Galleria Vittorio Emanuele II. 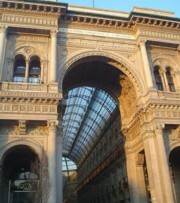 Built 1877, it is the salon of Milano with luxury shops and restaurants. The glass roof of the gallery forms a cross, which you can recognize very well from the roof of the Cathedral. Apart from the arms of the Savoy family you can find the symbols of the four most important cities in Italy: the Red Cross on a white ground of Milano, the Roman wolf, the swan of Florence and the bull of Turin. The Sforzesco Castle is open open daily 7.00 a.m. - 6.00 p.m.